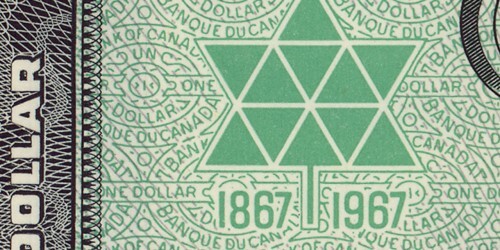 In the early 1950’s, the Bank of Canada contracted noted Canadian artist Charles Comfort to design their next set of bank notes. 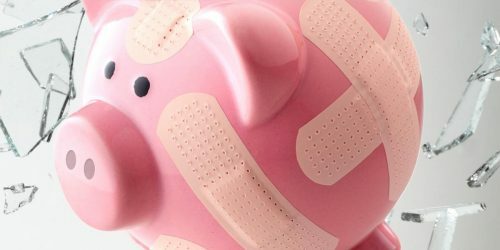 A single independent vision would be employed in designing bank notes whose modern simplicity was to be an enormous departure from the long-outdated offerings of the printing companies. 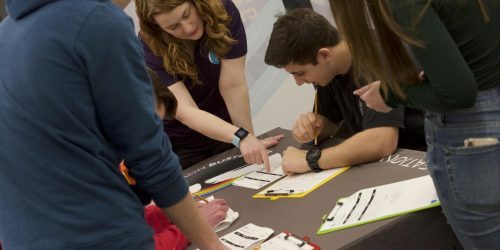 Officials at the Bank wanted the notes to feature images of Canadian landscapes that showed little or no evidence of human activity. 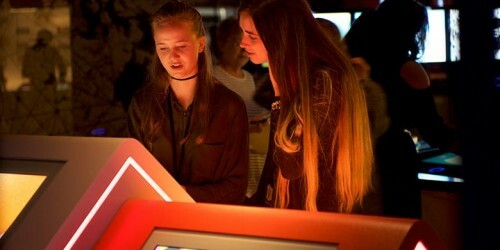 They chose the final 8 images from over 3,000 photographs supplied from the collections of railways, archives and news agencies. 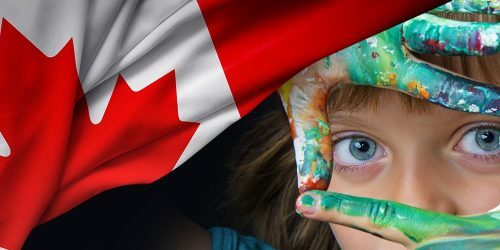 From the Maritimes, through Eastern Canada, the Prairies, the Rockies and the North, what resulted was an extended portrait of The Great Lone Land vision of Canada. 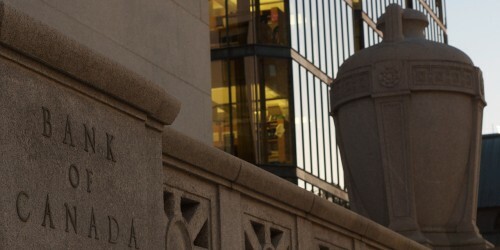 This vision was already out-dated, but served as the natural starting point for an evolving manifestation of official identity that would be played out on all future bank notes. 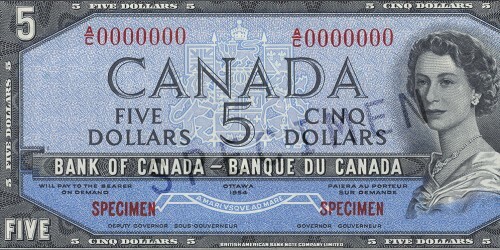 As part of that process, the Canadian coat of arms is visible behind the main text block on the face of every note and would appear on the faces of the next three series. The 1967 centennial special edition of the $1 bill does not feature a landscape. On the back is an engraving of the original Parliament Buildings built in the 1860’s and destroyed by fire in 1916. 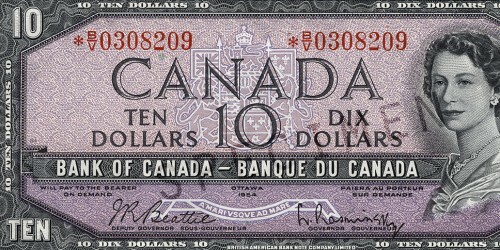 The same engraving previously appeared on a Dominion of Canada $100 note not long after Confederation. Despite the intended Canadian character of the series, this is the only one not to feature any Canadian personalities. 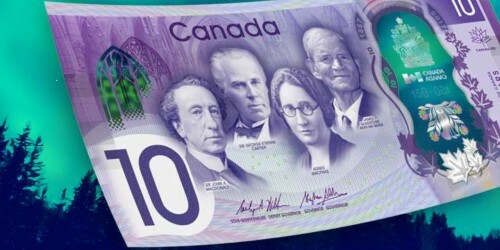 However, the engraving of the young Queen Elizabeth II that appears on each note was based on a photograph taken by the famous Canadian photographer Yousuf Karsh; originally commissioned for a stamp. 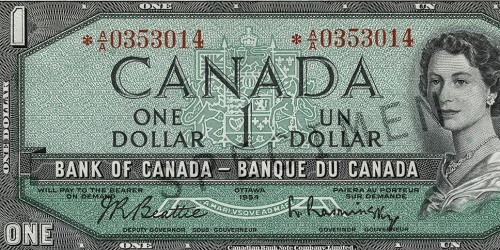 Initially printed by Canadian Bank Note Company Ltd. and later by British American Bank Note Company as well, the face of the $1 note features an engraving of Queen Elizabeth II based on a Karsh portrait that appears on all denominations in the series. 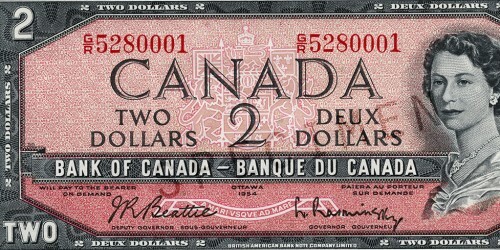 The $2 note was printed by British American Bank Note Company. 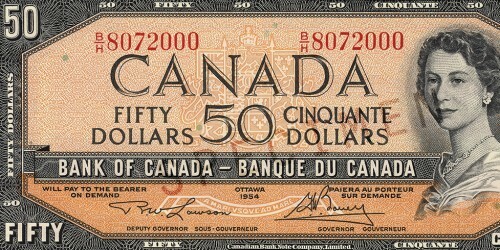 Note that the same border design is used on the front and back of the notes in this series. Until 1959, the $5 bank note was printed exclusively by British American Bank Note Company. The back of the note was engraved by C. Gordon Yorke of British American Bank Note Company and depicts Otter Falls on the Aishihik River, Mile 996 Alaska Highway, in southwestern Yukon. The back of the $10 note features Emerald Lake and Mount Burgess in Yoho National Park, British Columbia, and was engraved by Harry Dawson. 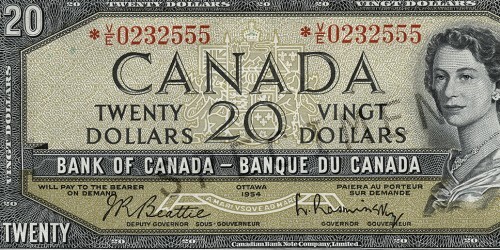 The $20 note was printed by Canadian Bank Note Company Ltd. 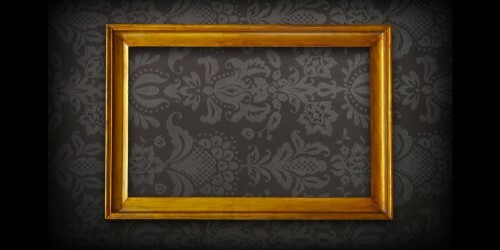 The face of the note, except for the portrait, was engraved by Andrew McMillen of American Bank Note Company. 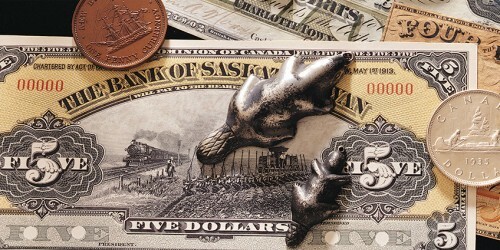 The seascape on the back of the $50 note was engraved by Warrell Alfred Hauk of American Bank Note Company from a photograph taken at Crescent Beach in Lockeport on Nova Scotia’s south shore. 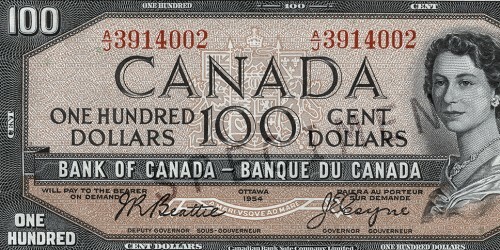 The $100 bank note, printed by Canadian Bank Note Company Ltd., features Okanagan Lake in British Columbia on the back. 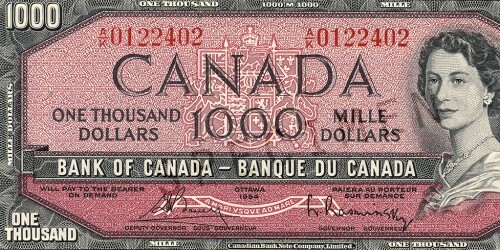 The $1,000 note was printed by Canadian Bank Note Company Ltd. The back of the note shows the covered bridge in the village of L’Anse-Saint-Jean, Quebec, and, in the background, the Saguenay River fjord.